A 10 day tour of Israel in 2009 was prompted by an invitation to Yossi Vardi's excellent Kinnernet unconference and a speaking opportunity at the Marker newspaper's internet conference right after. My first visit, I toured a number of key locations, and also a bit of Jordan. Another visit in 2012 features more shots. Amazingly, thanks to new generations of Panorama software and the low light 5D camera, all but 3 of these shots were done handheld! The western wall of the Temple, holiest remaining site of Judaism, about 10 minutes before sundown on Shabbat. The orthodox Jews believe photography is forbidden on Shabbat and were quite wary of me having a camera there in fear that I might use it after sundown. Even explaining you are not observant is not adequate -- they don't wish you to break the Sabbath in their presence either. Nonetheless I am proud of this legal shot which shows the variety of people gathering and praying at this special moment, one week before Passach. I find it amusing that here in the most holy place, white resin chairs are laid out beside treasured holy books in their special shelves. Atop the temple mount we find holy Muslim sites, including the unassuming Al-Aqsa mosque, 3rd holiest site of Islam, and the more audacious Dome of the Rock, which in theory covers the former site of the Jewish Temple, and the rock on which Abraham was ready to sacrifice Isaac. From 2012, the western wall and temple mount from a balcony, in a rainstorm with a brief arrival of some sun. Complete view from the Mount of Olives, including the cemetary and old city. (2012) You can read most of the tombstones -- in Hebrew of course. The Western Wall is an open air synagogue, divided into men's and women's sections. However, the "action" is on the men's side, so women go into their side and lean over the fence. Below the old city is the City of David, now an interesting conglomeration of buildings stuffed into the hill. In Akko, an experiment with a multi-row spherical panorama to show the mosque. I like the cognitive dissonance of the traditional building with the LED display that reports prayer times. The Khedron valley contains the garden were Jesus was allegedly betrayed. 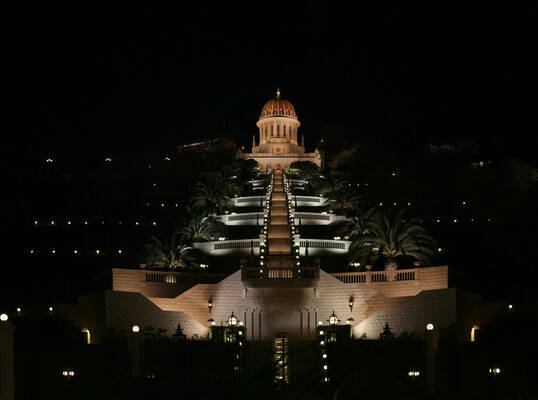 The mount of Olives behind it is supposed to be the place where people will be gathered first into heaven, so cemetery space here is at a super-premium. 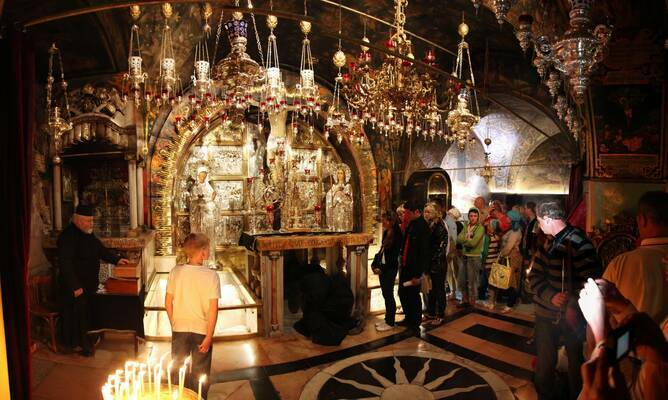 Another holy of holies, for Catholics and Eastern Churches, the supposed site of the crucifixion. People line up to kneel before the hole where the cross was supposedly placed and pray. Sunrise over Haifa, from up on Mt. Carmel. This is a super-high resolution shot of the Dome of the Rock, though I did not complete the sky. Try the Full-Rez slice! 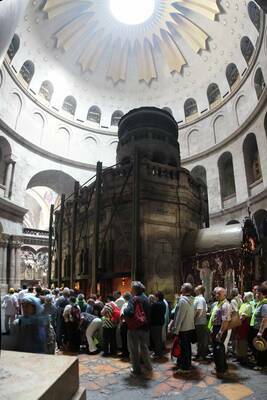 The official "Tomb of Jesus." Christians line up to go inside, and then come out a bit disappointed. There is, after all, nobody in there, which is the whole point of their religion. Hand-held shot with amazing 5D camera, people are fuzzy because they are moving. 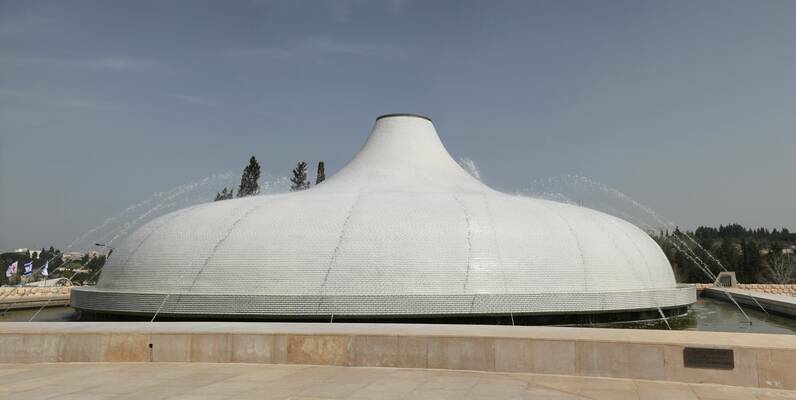 The roof of the "Temple of the Book" which houses the dead sea scrolls. The underground Crusader citadel at Akko/Acre, or rather one of the chambers within it. The Bahai temple and gardens, at night. The Roman Amphitheatre at Ceasaria, seen from the top. People gather at the Western wall of the temple in Jerusalem at sunset on Friday (Shabbat.) Shot from the steps to the south. The Church of the Holy Sepulcher houses the holiest of holies for Catholics and Eastern Orthodox churches, the site of the cross, stone and tomb of Jesus. It is controlled by 3 churches so nothing ever gets done. Note the ladder on the upper window. It's been there for 150 years as nobody dares to move it. Lake Kinneret, known as the Sea of Galilee to Christians. Site of the walking on water etc. To Israelis, it's the only lake in their country. In the background are the Golan Heights, captured from Syria in the war. 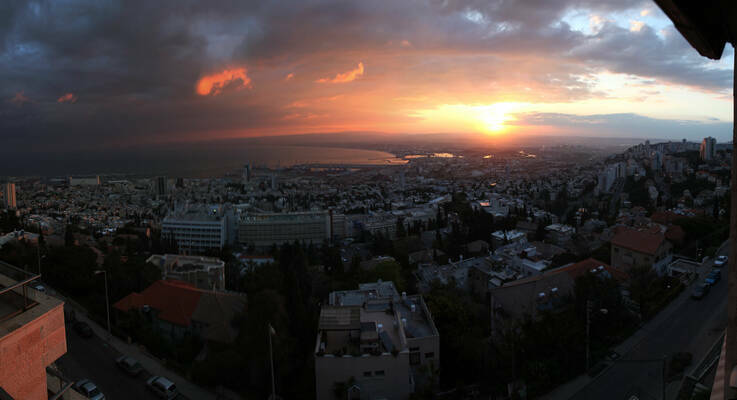 A panorama from the Dan Panorama hotel in Tel Aviv. A view of Masada made moving around its highest point. Due to the need to move there are stitching errors but it captures the scope of the top of Masada. The Dead Sea, at sunset. 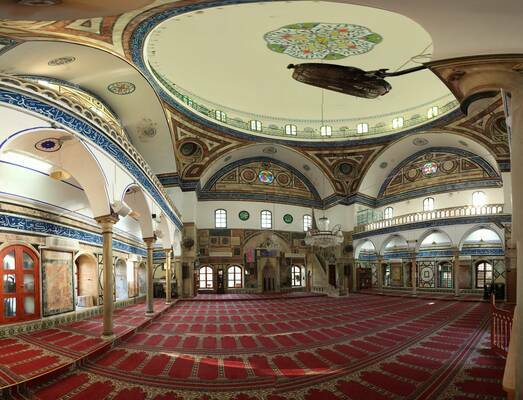 You can also see Page 2, with more panoramas of Israel.